Summer is finally here! It is the day that most kids look forward to on the first day is here, the last day. It has felt like summer, off and on, since March, but today it is 50⁰F, overcast, and drizzling. It feels more like early fall than summer. However, it is here. The week has gone by quickly and I passed out yearbooks at the end of school yesterday. Most kids get one and they looked inside trying to find themselves, their friends, and looking back. Before yearbooks, it was the last class for the year and I collected their letters to their 8th grade teacher. When I handed it out Tuesday there were a few who balked at writing another letter – especially one with five paragraphs. With a few exceptions, I got them all. I read them checking them off in my gradebook, updated it, and finalized grades before I came home last night. I’ll have a couple of changes to make tomorrow and then, thankfully, I am essentially done, in that department. Olivia and William are finishing their last week of school before three days next week, though there is a huge difference between a third grader and eighth grader. There has been a lot of stress as the year has ended with the algebra final, the Constitution test, and all of us looking down the road at summer break. Summer break brings a sense of excitement and a sense of dread, too. The last day is full of saying goodbye and wishing everyone a great summer. Yet, there is that anxiety of ‘what’s next?’ For me, I am back next year, same team, same partner, same curriculum, and same rooms! I am excited, I don’t have to move but I need to pack up, clean off my desk, and even though I really should clean out my filing cabinets and folders, I’ll save it for another time, another day. 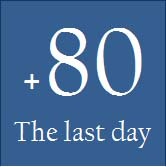 For my students the eighty-three days begin today, for all the teachers, and me it is eighty. They will go quickly. I have my reading list, I have nine books selected so far and my goal is 20 books this summer. I have other goals, the mile swim, summer camp, getting in shape, getting organized, and so many more. But, for today, I am going to savor the moment and remember how much each one of my students have taught me. Making the Days Count, one final day at a time. Do you remember a last day of school, or at a job and how you felt? Let us know! Great writing and I too am trying to make the days count, thanks to you inspiring me. You are absolutely spot on, cherish the last day with these special young people. You are making a difference in their lives, they may not realize it until later in life, but you’re doing Mr. Watkins! Rock on!!!! Congrats on making it through another year and continuing to challenge yourself to always do more. I sometimes struggle to look within and work on making me a better person. Kudos to you for being brave enough to look within, sharing your life, thoughts & experiences with others and sharing the path you are taking to make the days count. Wishing you a wonderful 80 day break!! Barb – thanks for stopping by – at the blog and in the classroom on Thursday. It made my day, really. I am looking forward to a great summer and have already begun to ‘step out!’ and getting things done and moving forward. Thanks have a great day!